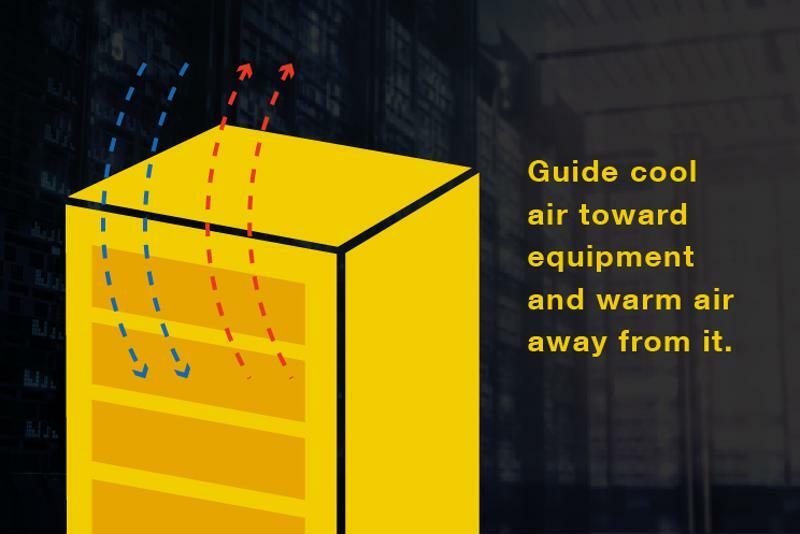 Data center airflow management operates on a simple premise: IT equipment should only ever take in cool air; CRAC return plenums should only ever take in warm air. Under no circumstances should there be mixing of cold air and return air. Yet, many data centers struggle to facilitate this dynamic, and at a high cost to their operations. Data center cooling is infamously expensive, accounting for 40 percent of annual data center spend by some estimates. Inefficient airflow exacerbates this problem by causing hot spots that are all too often addressed by increased cooling capacity. Well, we’re here to say “no more!” Airflow management doesn’t have to be complicated if you adapt containment methods that are uniquely suited to expelling exhaust and keeping the cool aisle cool. When cool air passes through the IT load, a heat exchange occurs. Cool air becomes hot air, which is expelled into the hot aisle behind cabinets. Here it will ostensibly rise into return plenums, to be treated once again by CRACs, so that it can be cycled back into the cold aisle through perforated tiles, and drawn in by server fans – so it goes. It only works if an adequate supply of cool air actually passes through the IT load, as opposed to passing around it or never reaching it at all. It operates under the assumption that warm air in the hot aisle will automatically rise to the return plenum; but that only works if zero pressure is maintained as treated air passes through the IT load. This isn’t possible if hot air seeps into the cold aisle because it isn’t properly contained, or because there’s a shortage of cool air being taken in by server fans. Often, traditional hot-aisle, cold-aisle setups will experience hot spots as a result of this combination of problems (bypass airflow and re-circulation air, respectively). This is especially true for high-density racks that generate more heat, particularly for servers that are positioned higher up and therefore farther from the perforated tiles on the ground. Given these circumstances, how do you simultaneously ensure that servers get enough cool air and that hot air is expelled? Airflow management doesn’t have to be complicated. The answer: Abandon your hot-aisle aspirations and use active containment chambers instead. The most effective way to balance airflow in high-density racks that are susceptible to hot spots is to directly pipe return air into the ceiling plenum through a containment chamber placed atop each rack. Small fans that respond to pressure changes are embedded within those chambers. So, for example, if there’s a shortage of cool reaching the IT load at any given moment, those internal fans increase RPM to maintain optimal air intake and outtake pressure. It sounds complicated, but again, the premise is simple: Cool air goes into the server fans; hot air comes out the other side and is sucked in through the containment chamber and back up into the ceiling so that it can become cold air again. It’s quite possible that certain parts of your data center or server room have low-density racks that don’t necessarily warrant an active containment setup. In these cases, passive containment should suffice – with one notable exception. Many top-of-rack network switches are configured backwards so that connectors face the maintenance aisle. This can result in the reversal of airflow (back-to-front as opposed to front-to-back), a problem that’s compounded by the fact that ToR switches are farthest from the cool-air source in a raised-floor data center setup. Under these circumstances, it might not be worth it to implement active containment for every single cabinet. The more cost-effective option is to install fans in front of the switch that draw in cool air and route it into the equipment’s air intake. This ensures that a steady supply of treated air passes through equipment, regardless of its orientation on the rack or its distance from the cool-air source. Who said airflow had to be complicated?